Jakarta Restaurant, established since 1987 in central London and serving the finest Indonesian, Malaysian and Thai cuisine, has now opened in Colindale and would like to invite you to enjoy the pleasant atmosphere and surroundings over a delicious meal. This is a warm and welcoming, family-run restaurant where all dishes are freshly prepared to order and served by friendly Indonesian staff. Open Mon-Thu noon-11pm, Fri-Sat noon-11.30pm, Sun noon-10pm. All major credit cards accepted (not Diners). No service charge. Malaysian cuisine is extremely diverse. Each racial group has contributed to the great Malaysian gastronomic heritage. 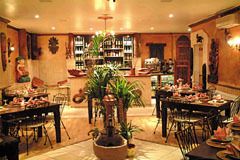 Its cuisine comprises of three main groups namely Malay, Chinese and Indian. Malay cuisine is mainly rich and spicy arising from a great use of spices. Expect many dishes to encompass coconut milk, chilies, onions, cucumber and spices such as cinnamon, cloves, nutmeg, garlic and coriander.